The day we shot the Red, White and Blue show was probably my favorite day of the trip. We arrived at the marina and loaded gear into the two boats while an amazing sunset exploded the sky with color. As we rolled out into the channels that led us to the Mississippi it became clear that this would be by far, the calmest day we had seen. We stopped on our way out to cast net some mullet, then headed out a little ways to Sabiki up some blue runners as well. I was on the fishing boat from the start, so was able to shoot some good bait catching shots and some other detail stuff that I hadn’t been able to do from the camera boat. The little sharks were quick to join the blue runner party, so as Scott and Steve loaded up the livewells, I shot some underwater of the little bait stealers. I use a GoPro on a long extendable pole for this kind of shot, it allows me to stay dry and to switch quickly back and forth between underwater and regular photography. The little sharks were fired up after eating a couple of runners, and would come right up to investigate the GoPro with mouths open. I had to dodge the teeth and bump them a few times, but got some fun shots. In about 20 minutes, we were full of bait and settled in for another half hour run out to a deep rig that Captain Billy Wells hoped was holding tuna. Quickly after arrival at the rig, we saw tuna busting the surface, so they tossed out a few freebies and dropped back a couple of baits and quickly came tight. Scott made quick work of a little Yellowfin, which Steve handled and released. Scott dropped another bait back and a few minutes later called out “white marlin”. He had just seen a quick glimpse of a rounded dorsal working his bait and blurted it out. He came off the declaration a bit as he talked through what he had seen, “could have been a shark…” But he was determined to find out, a moment later he felt the bite, and dropped the bait back so that the fish could eat. Then he reeled down on it, setting the circle hook, the line came tight and the rod bent under the pressure, but there was no jump. Probably just a shark we all thought. But Walker had just come from a summer of amazing white marlin fishing in Maryland, so certainly nobody would want to call his instincts into question. A moment later it launched proving his call correct, and then kept jumping putting on a great aerial display. Scott loves white marlin almost as much as sailfish, so hooking this fish 1200 miles from where he was catching them a couple of days earlier was awesome. The fight lasted about 25 minutes and when they pulled the fish along boatside, they realized that it was about a 100lb fish, which could have won a lot of money at the tournaments that Scott had been fishing back in Maryland. After a nice release we circled back around to the original position a little ways off the rig. Now it was Steve’s turn. In the next half hour or so, they caught a few little tuna and worked through some sharks then Steve got a big bite. It became apparent quickly that he was locked into a pretty big yellowfin and that this might take a little while. After about a half hour, he got it to the surface, but with a cameraman in the water and the camera boat coming over for a shot, each time it came up, it would sound again. I was able to use the extended battle to my advantage to get some underwater shots of the tuna and a hammerhead that was investigating the activity. Eventually they brought the tuna on board and again we circled back to deploy more baits. This time they dropped back a little tuna with the other baits to see if there were any bigger marlin around, and it turns out there were. 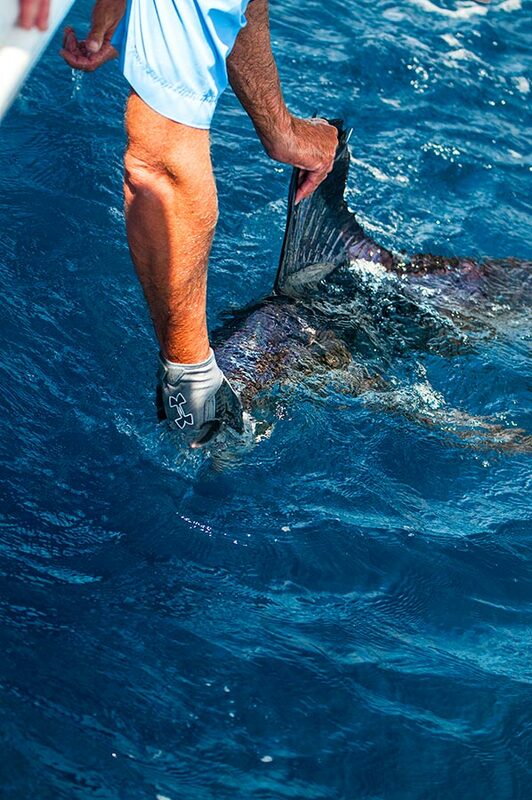 A half-hour after catching the tuna, Steve’s marlin bait got hit hard, and a big blue marlin went airborne. Next, it did a series of jumps right past the rig before circling back around us. The fight went on for about 10 minutes before the big fish broke off, leaving us in silence. Despite losing the big blue, it had been a great day. They went on to catch a few more little tuna before a nice relatively smooth ride back to the docks. This show is really a tale of two very different kinds of fish and different kinds of fishing. As I discussed last week, the wind had been hammering us on and off (mostly on) during our stay in Louisiana, so we had to come up with options that kept us in the fish and out of 10 foot seas. On last week’s show you saw one of those options, as we fished a nearshore rig for red snapper. Another close in option was to go rig to rig searching for cobia. Cobia are strong aggressive fish and are also great on the dinner table. They can be deep at times, but are just as likely to be cruising the surface circling a rig, where they can be sightfished. So the drill was to pull up to a rig and look around on the surface while casting jigs and letting them drop down a ways next to the rig before retrieving them. There is no lack of structure out in the Gulf and it didn’t take us long to find a couple of big brown bombers cruising the surface. Scott hooked one quickly on a jig and its partner sank out of sight before Steve could double it up. Steve kept casting as they will often hang around a hooked fish, but we never saw the second fish again. It took a little while, but Scott got the fish boatside and Steve scooped it up in the Frabill net then it took a nice cool ice bath. A half hour later Scott hooked another nice cobia and they repeated the scenario. The tripletail fishing was a little bit different. While they do love structure, we found them in the bay where we were catching bait for the red snapper show just drifting on the surface. So for tripletail, the technique would be to drift the bay with the wind and current looking for single tripletails floating on the surface, then cast live shrimp to them. So we set up on the upwind side of the bay and drifted. We seemed a little overboated, with 2 boats in the upper 30’ range fishing in 15 feet of water, but you roll with the hand you are dealt. And besides, the tower on the 39’ Yellowfin gave them a great height advantage for sightfishing. So Scott, Steve and Captain Kevin Beach from Mexican Gulf Fishing Company were all in the tower with a couple of light spinning rods and a bucket of shrimp. Tripletail are funny creature, they will float on their side drifting on the surface or right up against some sort of structure mimicking trash until something smaller swims up to use them as structure themselves, and gulp! When you first see them floating they look like a plastic grocery bag or some other trash until you can get a closer look. We ended up seeing 5 or 6 in our first drift and Steve was able to hook two, getting one to the boat and into the ice. It was Steve’s biggest tripletail to date and he later gave a little clinic on cleaning them back at the dock. Quote of the day “Homie’s like a band-aid” Steve said as he explained how they stick to structure. The northern Gulf of Mexico can be a nasty place. As Steve said, when the wind blows, this place is no joke! So, we had some days when we could get out and chase pelagics, and other days when we were lucky to get out at all. We had the 39’, so that upped our game and allowed us to get out when others were stuck inside, but still on some days going way out just wasn’t a good idea. Luckily, the Gulf has a lot of options including cobia, tripletail and red snapper when going way out isn’t a great idea. On this day, we chose to hit a nearshore rig and have some fun pulling on red snapper and put some filets in the box. It’s likely that no other fish has been the center of as much controversy over the past few years as the red snapper. There is an extreme disparity between stock evaluations and ideas of whose to blame if there is indeed a problem. In the Gulf there seems to be even more issues: with all the oil and money involved, State and Federal agencies have much more to think about, when it comes to who gets to regulate the fish/fishing. Either way, there is no arguing that the oil rigs make excellent habitat for red snapper and that there are plenty of snapper rigs available. So we headed out to hit a rig with Captain Kevin Beach of Mexican Gulf Fishing Company with red snapper in our sights. Our first stop, as usual, was to catch some bait. This time, we headed into one of the many shallow bays and threw the nets to catch menhaden instead of using Sabikis for blue runners. Right off the bat, they were hooking up on nearly every drop back into the rig. Many of the fish were pretty small, but eventually, Scott worked a live bait down through the smaller fish and pulled up a couple of keepers. Steve went a different direction and tried to 3 or 4 on at a time and was successful with a multi-hook rig, but Scott’s fish were bigger. A bigger jig was dropped back a few times to prospect for cobia as well, but none showed up at this rig. Later back at the dock, the Bubba Blades came out and the snappers were fileted, some heading to the dinner table and others went into the Yeti Hopper for the plane ride back home.